For all the talk about late stage rounds, megarounds and unicorns, early stage startups are benefitting disproportionately from near-record years of venture capital investment. Of the $42B invested in startups in 2015, 34% or about $14B was raised in series A and seed rounds. That figure is up from 18% in 2005. 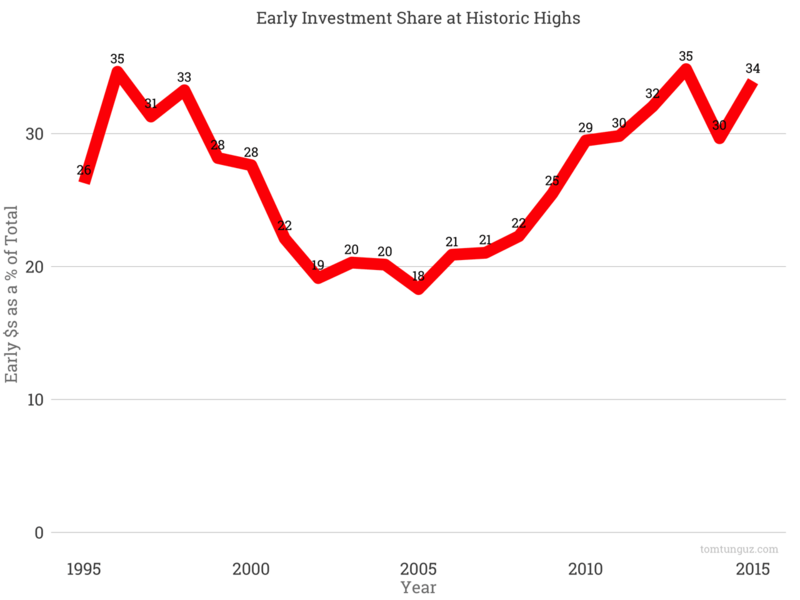 The 35% attained in 2013 share for early investment ties the 1996 record. Both an increase in the number of investments and the average amount raised by early stage companies has contributed to this trend. On average, 25% more early stage startups raise capital in the last five years compared to 1995-2000. And when they raise, they raise at near record amounts. 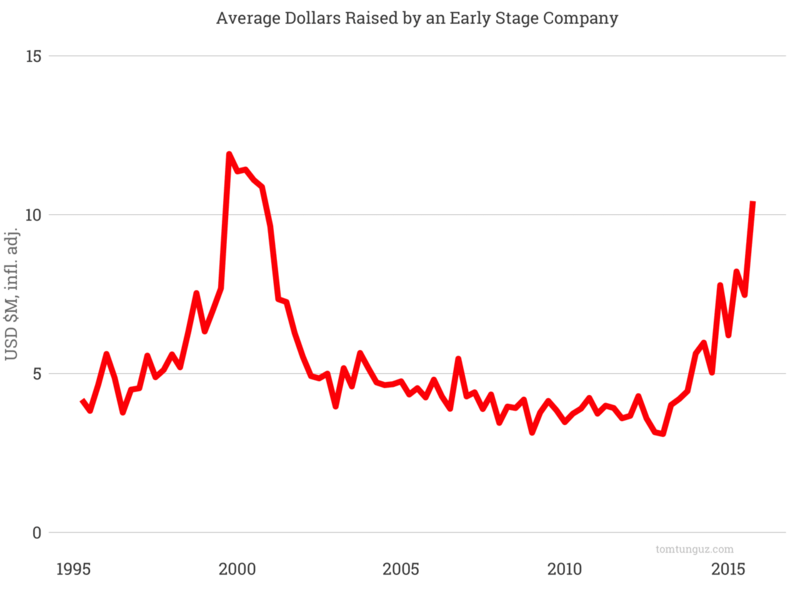 The chart above shows the average dollars an early stage company raises adjusted for inflation. Today, we’re quite near the 2000 highs of $11.9M, at $10.4M. In Q1 2014, the market abruptly changed course from a steady decline of round sizes in the early stage market into a massive upswing. Perhaps the strong IPO year in 2013 enticed investors. Among the names going public that year: Tableau, Marketo, RocketFuel, FireEye, Twitter and Xoom. The Facebook IPO was also just a year old. As the dollars and volumes of deals have increased, so too has the shift to consumer companies. MoneyTree data shows B2B companies still command 75% of venture investment dollars across all stages. But consumer has been rising steadily to more than 25%, again a figure not seen since 2000. Consumer startups tend to have higher failure rates than their enterprise cousins, but their upside can be unbounded. Compare the largest SaaS company, Salesforce at $50B in market cap, to the largest consumer companies, Google and Facebook at roughly $500B and $275B market cap respectively, to prove the point. If we are starting to see a decline in the pace and amount of venture capital investment, I suspect we will see a reversion to the mean for the consumer/enterprise split favoring enterprise businesses. 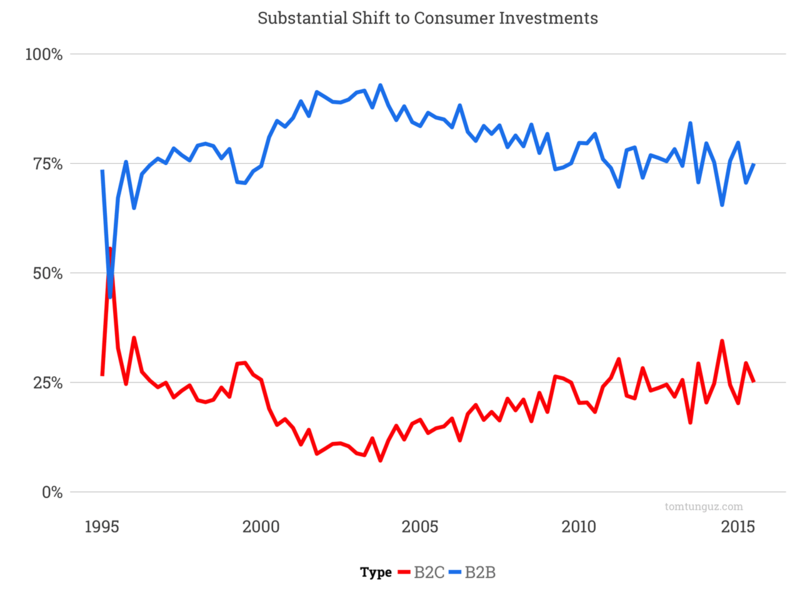 The secular shift toward B2C businesses won’t continue forever. As for changes in the early and late stage markets, the early stage market should remain relatively stable. Because VCs, both institutional seed investors and Series A investors, raise funds across 10 year periods, the bulk of the capital raised from LPs targeting the early stage market are already committed and will have to be deployed. The late stage market may witness a different phenomenon. More than 40% of the dollars invested in Series B and later rounds originating from corporate venture capital, mutual funds, hedge funds and family offices. This money isn’t committed to startup investing. Investment strategies for these types of investors can change quickly. If suddenly all that capital were to disappear and everything else were to remain the same, about $10B would leave the startup ecosystem - a drop of 25%. That would surely be felt across Startupland.